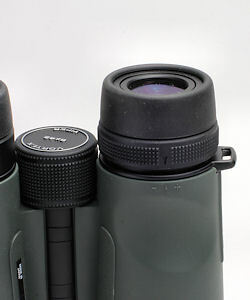 Vortex’s excellent, mid-level binocular, now with HD glass! Superb minimum close focus of just 5 feet! When the original Vortex Vipers were released some years ago, they quickly became a favorite of ours. Their excellent optical performance at a mid-price range ($400-$800 is “mid-priced”) made them a great value. When Vortex began shipping the new HD version of the Vipers, we were very interested to see how much improvement they offered over the originals. We finally got a chance to play with them and found that they are notably better than the originals, well worth the additional $70 in cost. Let’s back up and define exactly what we are looking at here. The new Viper HD line includes 6x32, 8x32, 8x42, 10x42, 10x50 and 15x50 models as well as 8x28 and 10x28 compact versions. This review concerns only the 8x42 and 10x42 models. The bottom line is, where the old Vipers were good, these are better – a lot better. Since the big difference is the glass, that’s where we’ll start. The new Vipers are made with HD (high-density) glass, which is extra-low dispersion, meaning it separates light into its component wavelengths less than normal glass, thus delivering a sharper image. In part, this performance is due to the presence of heavy rare-earth elements in the glass, which gives it the greater density. If you measure the mass of the same volume of HD and normal glass, the HD glass is heavier. The lenses are fully multi-coated with Vortex’s proprietary XR coating to provide increased light transmission for greater brightness. To this, Vortex adds their ArmorTek coating, which renders the lenses more scratch resistant and reduces the ability of dirt and oil to adhere to the lens, making them easier to clean. Naturally, the Viper HDs are phase-coated as well. The 42-mm HD Vipers are of typical size for a roof prism binocular: 6 inches long with the eyecups fully extended, by 5.0 inches wide. The 10x Viper HD is slightly heavier at 25.8 oz. than the 8x weighs at 25.4 oz (weights include the tethered objective lens caps). 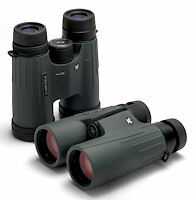 Viper HD binoculars are about 1.5 to 1.7 ounces heavier than the old Vipers, though that difference may also reflect design changes elsewhere on the binocular. Visually, you’d be hard put to distinguish between the old and new Vipers. Both feature the same ribbed, pale olive green rubber armoring with black accents. The shallow thumb grooves seem to be placed a bit too close to the ocular lenses for optimum balance, but the feel in the hands is still comfortable and secure. A number of optical performance traits remain unchanged between the old Vipers and the new HD version, but since those were very good before, no change is a good thing! Overall, the optical performance of the 42-mm Vipers is quite impressive. Both Viper HD binoculars have fairly average fields of view with the 8x model yielding 347 feet at 1000 yards while the 10x has a 319-foot field. We measured the minimum close focus of both models at 5.1 feet, which is way better than average for 42-mm binoculars. We also liked the knurled surface of the focus knob and the diopter adjustment ring (see below), which provide great purchase to the fingers. On the 8x model, the eye relief is excellent at 20 mm, while the 16.5 mm of eye relief on the 10x version is more average. Both models require 1.7 turns of the focus knob to go from minimum close focus to infinity. Focusing is very smooth and precise, which, combined with the excellent image quality of the Viper HDs, means things just snap sharply into focus with ease. In our field tests, the Viper HDs were at least slightly brighter than anything else in the mid-priced bracket, including some optics that cost quite a bit more. Field curvature at the edges was minimal, meaning that the image stays sharp almost all the way to the field edge; there was no ring of mushy focus at the outer edge. Chromatic aberration was minimal and mostly confined to the outer edges. Overall, the optical performance of these new HD Vipers was exceptional, and field testing them was a pleasure. Most binoculars have at least two user-adjustable features: the eyecups and the diopter. Getting both adjusted correctly is critical to binocular performance and user comfort. In both cases, Vortex Viper HDs handle it quite well. The eyecups adjust with a twisting mechanism through four positions, fully in and out, and two intermediate positions marked by solid detents that don’t collapse readily. Most manufacturers make eyecups that adjust this way, but few of them have the smooth operation or solid feel of these. These eyecups are metal-reinforced so they won’t fall apart like some we’ve seen. The diopter adjustment is a fully locking twist-ring on the upper right barrel, just below the eyecup. Pull the ring toward the ocular to unlock it. A triangle on the ring lines up with a vertical hash mark between the plus and minus signs to denote the position of equal focal length for both oculars. Push the ring back down to lock it in place. The only place for improvement here would have been some markings to help denote positions for unequal eyes, but Vortex is way ahead of many more expensive optics in these adjustable features. The Viper HD rainguard is the standard one we see often: two pliable rubber cups about an inch deep, joined by a flexible tether. The strap loops through a fixed bracket on one side and a gapped (detachable) bracket on the other. It’s a fine system though attaching it to a harness type strap is problematic. In this case, that’s no problem as the rainguard fits so firmly over the eyecups that you can’t dislodge it even by inverting the binocular and shaking it. Both objective lenses have soft rubber caps that fit snugly over the ends of the barrels and are attached to the barrels by flexible rings and short tethers so they can’t be lost. Thus, you always have them in the field when you need them. The rubber is pliable enough that they don’t spring up and block the view. They don’t show much tendency to close by themselves as the binocular rested against the chest. As tethered caps go, these are really very good. The included neck strap is a fairly standard design of neoprene-like material welded to soft leather, and it’s comfortable enough without being particularly cushy. The Viper HD carrying case is the same great one from the old Vipers. This well-padded cordura bag features a zipper-closing net pouch on the underside of the flap, and is big enough to fit the binocular and folded strap. The case is at least water-resistant if not waterproof. It has loops on the back for belt attachment if the included shoulder strap isn’t what you want. You could carry a field guide in it when you have the binocular out. This is a great case! The VIP warranty policy on the Vortex Viper HD binoculars is worthy of note too. Should they ever require service, Vortex will repair or replace the Vipers absolutely free except for deliberate damage, theft or loss. The warranty has no time limit and is completely transferable. We billed the original Vipers as delivering high-priced binocular performance in a medium-priced binocular. That statement is truer now than it was then, as the improvements to the optical performance more than compensate for the slight additional cost. The 8x42 Vortex Viper HD sells for $489.99 and the 10x42 model is $499.99. People are already responding to them with enthusiasm. There’s that “Wow!” reaction when people pick them up for the first time, and we are already seeing quite a few of them in the field. If you are ready to upgrade for your binoculars, the 42-mm Viper HDs are a binocular you must seriously consider.